Panna cotta, which translates to cooked cream in Italian, is one of my favorite desserts. Panna cotta is light, quick and easy to make and can feature an endless number of flavors, from chocolate, to pumpkin, to caramel to virtually any fruit. My personal favorites are fruit panna cottas, topped with seasonal fruit. My new favorite fruit panna cotta is this Passion Fruit Panna Cotta. Passion Fruit is truly an amazing fruit. It grows on a vine, has a thick, hard shell filled with juicy, fruit-encased edible seeds. The passion fruit flower is gorgeous and reminiscent of something from Jurassic Park or how I envision the garden of Eden. Passion fruit has an alluring fragrance and taste that instantly puts you in a vacation state of mind. Passion fruit is a great addition to dairy-based desserts like flan and panna cotta, it makes an incredible pie, and is out of this world in a mojito or my favorite sangria. Passion fruit has significant nutritional and health benefits, with several studies using passion fruit to relieve asthma and treat anxiety and depression. You can read more about passion fruit here. I planted a passion fruit vine last August and to my delight it bore fruit within a month. Not a lot of fruit, but a good half dozen fruits. Fast forward a year, and I am estimating I will harvest over 100 fruits before the season ends. Can I tell you how happy I am? Making passion fruit juice is a bit of a pain and it takes an enormous number of passion fruit to harvest a small amount of fruit. Depending on the size of your passion fruit, which vary greatly, it will take about 8 passion fruit to make 1/2 cup of passion fruit juice. Put the passion fruit seeds in a sieve placed over a bowl and rub with the back of a spoon to extract as much juice as possible. The thing about passion fruit juice is it is very powerful and a little goes along way. If you don't have access to fresh passion fruit you can purchase passion fruit puree. Funkinpro makes a good product that is 90% fruit and 10% sugar. The thing about passion fruit is it is tart, so you will have to add some sweetener when you use it in desserts or cocktails. The Funkin Passion Fruit Puree comes in a large 1 kilogram container. You need to use it all within 8 days of opening or you can make over-sized ice cubes with it and freeze it for later use. If you have fresh passion fruit, the best way to garnish the panna cotta is with the fresh fruit. Depending on the size of your passion fruit, allow 1/2 fresh passion fruit per panna cotta serving. The seeds are edible, good for you and promote intestinal health. If you are using passion fruit puree, you will need an alternate fresh fruit topping. I suggest chopped mango or pineapple. Put half a cup of passion fruit in a small bowl and sprinkle with Knox plain gelatin. Allow to soften for 15 minutes. Put cream, milk, vanilla, lemon zest and sugar in a heavy-bottomed sauce pan. Heat until mixture just starts to bubble at the edges of the pan. Do not allow to come to a full boil. Remove from heat, cover and let steep for 15 minutes. Whisk passion fruit and gelatin mixture together and then into the warm milk and cream mixture to dissolve. If your cream mixture has become too cool, you may need to warm it briefly to dissolve the gelatin mixture, just take care not to let it boil as that breaks down the gelatin's ability to firm up. Whisk in the yogurt and divide into 6 ramekins or decorative glasses. Each portion will be about 3/4 cup. Allow to cool to room temperature then cover each ramekin or glass with a sheet of plastic wrap. Refrigerate for at least 3 hours or overnight. Top each panna cotta with fruit from 1/2 passion fruit, including the seeds. Alternatively you can use fresh chopped mango or pineapple. 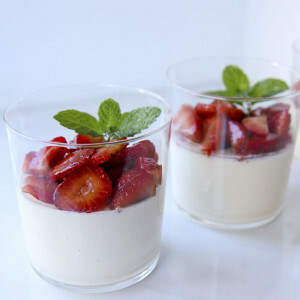 Panna cotta can be served in a glass or ramekin or unmolded onto a plate. 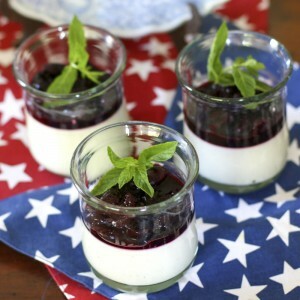 If you plan to unmold your panna cotta take the extra step of very lightly greasing the ramekin with cooking spray. Wipe up any extra spray before adding the cream mixture to the ramekin. Can I replaced with carnation evaporated milk? 2 teaspoons of vanilla extract ok? Plain yogurt( nestle ) ok ? Hi Sharon, I have never made panna cotta with carnation evaporated milk so I can’t tell you if it would work or not. Panna cotta is very forgiving, so it may just work. My question is why do you want to use canned milk? Yes, you can substitute vanilla extract or vanilla paste for fresh vanilla bean. I use plain Greek yogurt. It has a thicker consistency and tangier taste than regular yogurt. Good luck! I’d love to hear how the recipe works out with your substitutions.